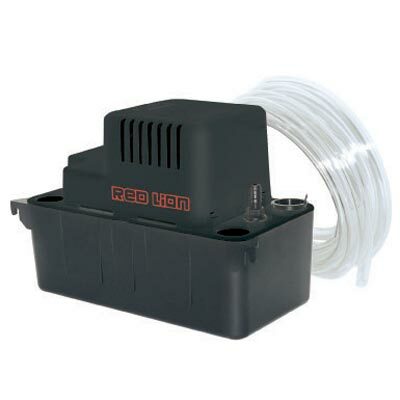 Easily collect condensation from your air conditioner, furnace, or ice maker and remove it with the Red Lion Condensate Removal Pump. This handy, versatile unit effectively relocates collected water from your boiler or furnace, and can elevate it up to 20' for easy movement. Integrated hooks on the 1/2 gallon reservoir enable this item to connect to a wall or the exterior of your air conditioning unit, fitting beneath the coil to consistently collect the condensation. Three separate inlets on the tank offer versatility in placing the item, and the included 20' of plastic tubing attaches to the barbed outlet easily. Its ABS thermoplastic construction withstands use in a variety of locations, and lends impact and corrosion resistance to the unit. A removable check valve offers simple maintenance and checking of the reservoir, and a float valve in the item activates it when the when the water level reaches 2 1/4". The motor turns off when the water drains to 1 1/4" in the reservoir. Remove collected water from your furnace or ice machine with this Condensate Removal Pump. Three year limited warranty.